GORHAM -- University of Southern Maine freshman shortstop Sam Dexter is the son of a coach so it stands to reason he has an edge on many players his age when it comes to understanding the nuances of baseball. GORHAM — University of Southern Maine freshman shortstop Sam Dexter is the son of a coach so it stands to reason he has an edge on many players his age when it comes to understanding the nuances of baseball. That hasn’t stopped Dexter’s thirst for learning more. In fact, it’s probably whetted his appetite. “Sam picks things up quickly and he wants to know more,” said USM coach Ed Flaherty. As an example, Flaherty told about getting a text message from Dexter after a game earlier in the season asking about a cutoff play. The ball was hit down the line in short left field with a runner on first. Dexter wanted to remove any question he had of whether he should cut to third base or to second. The short answer was that he should cut to second because you want keep the hitter on first. Flaherty knew he was getting a gem when he was recruiting Dexter out of Messalonskee High in Oakland. “He is everything I thought he would be and more. If he’s not the best freshman I’ve had at USM, he’s certainly one of the best. I’ve had good ones, but this kid is special,” said Flaherty, in his 28th season with the Huskies. Dexter, 19, has been showing how special all season, but it was accentuated last week in the Division III New England Regionals in Harwich, Mass. Dexter powered the Huskies to the title and trip to the Division III World Series in Appleton, Wis., with home runs in consecutive wins over Western New England and Endicott on Saturday in must win situations. His second homer broke a 2-2 tie with Endicott in the ninth en route to a 5-2 win to force a deciding game for the championship with the Majors, which USM won 9-0 the next day. USM will play the opening game at 10 a.m (CST) on Friday in the eight-team national tournament. The Huskies (42-8) meet Millsaps College of Jackson, Miss. A year ago when Messalonskee won the Class A state title, Dexter remarked that it was the first championship team he had played on. Less than a year later, he’s played on his second. Having won over 800 games and two national titles as USM coach, Flaherty is not easily impressed. That changes watching Dexter. Flaherty talked about a relay throw Dexter made in the 5-2 win over Endicott. “The Endicott batter hit the ball over the center fielder’s head. It was in the bottom of the eighth inning with the score tied. When he hit it, I was thinking triple. Sam took the cutoff throw in the outfield and threw the runner out at third. It was like a major league throw. If the runner gets to third, he likely would have scored which would have put a lot of pressure on us in the ninth,” he said. Dexter said he has made a few adjustments, more in his hitting approach, to be ready for Division III. “At the end of the day, it’s still baseball,” he said. Dexter has played in all but one game. He missed the first Western New England game in the tournament when the flu bug hit the team. Dexter is batting .356 in the leadoff position. His 22 doubles lead the team. His 73 hits is third most. Dexter has four home runs and two triples. He has been successful on 13 of 15 steals. After hitting third at Messalonskee and in Legion ball, Dexter said he has learned to like batting leadoff. “I’ve learned my role. I still get a little over anxious at the plate. I usually don’t take too many pitches,” he said. Dexter is the son of Tom Dexter, the long-time Colby College baseball and football assistant coach. Dexter and his younger brother Jake, a sophomore at Messalonskee, spent many hours on the Waterville campus tossing baseballs and footballs around and learning the game from the ground up. “I think it was like my sons (Ryan and Regan) here at USM,” said Flaherty. Dexter was the Kennebec Valley Athletic Conference Player of the Year in football, hockey and baseball his senior year. 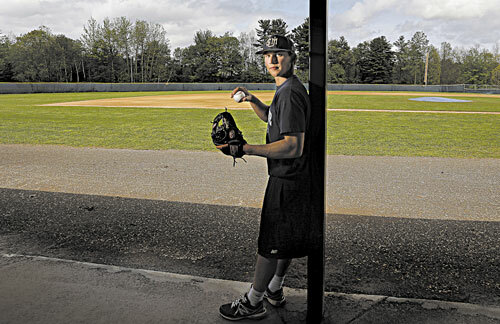 He was the Maine Sunday Telegram’s Athlete of the Year in 2012.